About: Popular with the Gay community, The Edge serves food in a relaxing cafe environment by day and transforms itself into a lively, three-floor bar at night. Catering for private parties of up to 95 guests is available upon request and seating on the pavement area is provided, weather permitting. 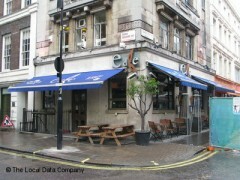 "Popular Soho Square bar continues to draw in the crowds"
Situated just off Soho Square, for years The Edge has been catering to thirsty drinkers and summer revelers needing to use the toilet after hours of drinking on the green. Four floors pump out chart hits and funky house to the mostly gay crowd, the top floor being a flashy neon affair, while ubiquitous cute barmen in tight vest tops stand behind the bar. Decor is on the flashy side throughout the venue, with plenty of bright lighting and flamboyant cushions adorning seating areas. Whilst four floors of fun may sound mammoth-sized, each room is actually rather small, meaning The Edge easily gets packed on busy nights. Food is available throughout the day and consists of the usual bar-snack grub of platters, fries, BBQ chicken wings, breaded prawns, etc. The cocktail list also has the usual mojitos, mai tais and Long Island ice teas; there are no surprises here. It’s not one of the cheapest bars as even a pint is around £4, however they do have a recession-busting Sunday lunch where two main courses and two glasses of wine come to only £15. There may not be any ground-breaking music played here, but it’s the location, friendly atmosphere, and being well established on the gay scene that draws the crowds in every weekend. We came in for a cup of coffee But they would'nt serve us.Had to drag our worn feet to Starbucks. We are from the Netherlands. In Amsterdam they would gladly have served us a cup of coffee in any gay pub. Our suggestion: if a family comes in please do not ignore them untill they leave but serve them or ask them to leave. What a disgrace !!!!! Been to the edge on many occasions. My work colleague was waiting to be served at the bar. And a group of my work colleges were waiting outside. It was 7.15pm and not many people were waiting, 2 bar staff were on duty downstairs. So, after 10 minutes I went into the bar to see why it was taking so long. I noticed 4 customers had come in while he was waiting and were being served, yet my friend was still waiting. The two bar staff; one black guy and another small guy were on duty. I informed them this was completely rude only then to be told by the small guy to f**k off!!!!!! I was mortified "what a disgrace", how un-professional and disgusting is this, many people around the bar then over heard and made an apology, however the barman who made the remark remained un-phased by what he said. It seems this member off staff needs to be taught some basic manners and with his current attitude is surprising how he managed to secure a job behind the bar. It seems that If your face doesn't fit then you don't get served......this is no excuse! In my opinion, better training or hiring procedures should be adopted otherwise you may loose many more customers.